When will be Sara's Weeknight Meals next episode air date? Is Sara's Weeknight Meals renewed or cancelled? Where to countdown Sara's Weeknight Meals air dates? Is Sara's Weeknight Meals worth watching? 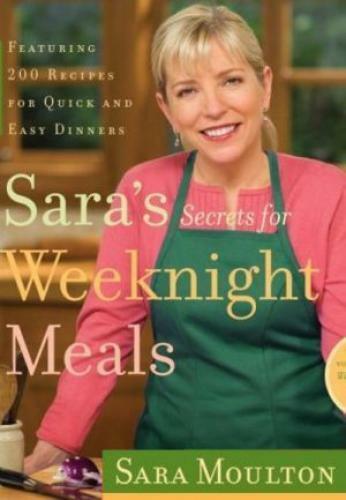 Renowned chef, television personality, magazine editor and cookbook author Sara Moulton brings her signature warmth and informative style back to public television in her new series, Sara's Weeknight Meals. Based on her book, Sara's Secrets for Weeknight Meals, Sara and her celebrity-chef friends share their ideas for flavorful, healthy meals with minimal fuss. Twenty fast-paced and engaging episodes feature quick, delicious and routine-breaking entrees designed to inspire and empower home cooks. Grilled shrimp and lettuce wraps; roasted branzino. Kielbasa sandwiches with kimchi and cheddar; chorizo chicken wings; egg cream. A traditional sinaya -- Middle Eastern shepherd's pie; falafel salad. Sauteed lemon chicken with capers; buttermilk fried pork chops; Wholesome Wave. Pork with Spanish olives and fideo; a specialty maker of chorizo. Mushrooms; vegetable storage; mu shu vegetables. Mini meatloaves baked in a muffin tin; macaroni and cheese made with leftovers; creamsicle drink for dessert; a Benedictine nun with a knowledge of raw cheese. Spicy greens ravioli; rock shrimp fettuccine; viewer questions about pizza dough and ricotta cheese. Mussels and bok choy with a side of tea pilaf; oyster and bacon pad thai; harvesting oysters. Roast duck with a side of duck fat popovers; deviled bones; viewer questions about mashed potatoes. Waffles Benedict; spaghetti with bacon, eggs and toasted bread crumbs; smoked bacon. Tea-rubbed duck salad with Roquefort and pear dressing; Napa Valley winery; salmon and corn salsa with pea pesto crostini. Fried chicken; winter chicken chili. Duck Creole; a traditional boil with crawfish, rice and spice. Traditional basil pesto, string bean and potato pasta; growing a windowsill herb garden; cooking with herb; brown and wild rice with broccoli pesto. Coconut lemon chicken soup; using the wok; Greek shrimp, farro and greens. Steak, mushroom and tomato salad; scallop and grapefruit salad; shopping for clean greens at a farmers market. Scallop, basil and prosciutto kebabs; Texas barbecue brisket; watermelon lemonade; the BBQ Pit Boys. Sara's Weeknight Meals next episode air date provides TVMaze for you. EpisoDate.com is your TV show guide to Countdown Sara's Weeknight Meals Episode Air Dates and to stay in touch with Sara's Weeknight Meals next episode Air Date and your others favorite TV Shows. Add the shows you like to a "Watchlist" and let the site take it from there.